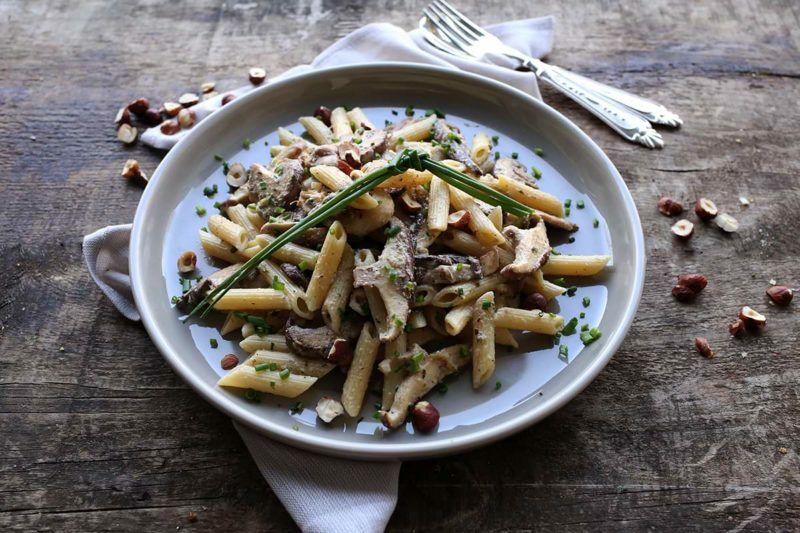 This wild mushroom pasta is definitely made for the culinary creative. It’s not only creamy and delicious but very elegant to serve as a special dinner or a romantic dish for two. In large pot of salted boiling water, cook pasta al dente following package instructions, reserving 1/2 cup of pasta water. In a large deep sauté pan, heat oil over medium-high heat. Add garlic and sauté for 1 minute until soft and translucent. Add mushrooms and cook until golden and soft, about 4-5 minutes and then season with salt and pepper. Reduce heat to medium and stir in goat cheese until melted. Add pasta and some of the pasta water and stir until creamy. Keeping adding pasta water until you have a creamy consistency. Toss in the fresh chives and stir until combined. Plate and garnish with tied whole chives and hazelnuts if using.